Tender beef is given a sweet, tangy marinade and then roasted to perfection. 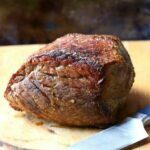 Delicious for Sunday dinners - leftover make the best roast beef sandwiches ever! Combine all ingredients except the beef. Place roast in a large freezer bag and pour the marinade over the roast. Close bag and marinate in refrigerator 12 to 14 hours. Remove roast from refrigerator and pat dry with paper towels. Pour out and discard the marinade and the chile. Season roast with an additional 2 teaspoons kosher salt and 1 teaspoon black pepper. Place in a shallow roasting pan fitted with rack. Roast 15 minutes in preheated oven; reduce heat to 325°F. Cook approximately 1 hour to reach medium (135-140°F) doneness. Remove roast from oven, tent loosely with foil and rest 10 minutes before carving.